G4J Connect:Inverness – The Debrief! 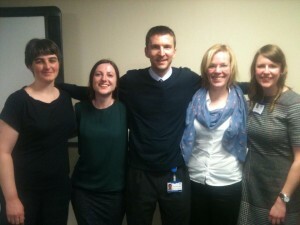 On the 18th March 2015 a G4J Connect event was organised in Inverness with video links to the Suttie Centre in Aberdeen, Dr Gray’s Hospital in Elgin, The Belford Hospital in Fort William, Caithness General Hospital in Wick and the Western Isles Hospital in Stornoway on the Isle of Lewis. The aim we had was to provide interactive presentations led by a variety of trainees from ST2- ST7. It was extremely well attended in Inverness with turnout from keen 4th and 5th year medical students and juniors doctors. The other sites also racked up good attendance of a mixed audience as well. There are many trainees and many elderly patients in rural areas of the UK, accessing these areas is difficult with big uni-centre events, however this event broke those boundaries and included those areas in a big event which is vital to recruitment in the future. We had some fantastic presentations on the night from Registrars whom had travelled from Aberdeen Royal Infirmary to join us here in Inverness. First up was Lynn Shields who talked about the useless urinalysis in the geriatric patient. Victoria Henderson capitalised on the comprehensive geriatric assessment with the MDT being described as a band of superheroes and Matt Greig provided an inspiring talk on how not to poison your granny with polypharmacy – empowering the audience to stop medications. The interactive cases provided by Claire Muir and Anne-Marie Shanks summed up the big principles that the other presentations had highlighted using cases that had an unexpected outcome. 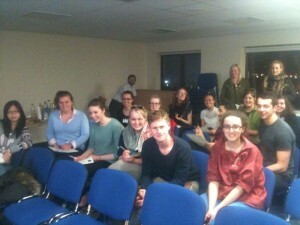 It was inspiring to see so many medical students and trainees turn out for the event. Each presentation provoked questions and discussion about cases. The main aims were to provide a bit of knowledge to juniors via innovative case based presentations so that they feel more confident in assessing and managing, as well as caring, for the elderly patients in their ward now and in the future. 57% of our audience were medical students who attended and as the organisers of the Glasgow events had suggested on their de-brief that we really need to target this group in order to improve application to speciality training and provision of geriatric care in hospitals. The feedback from the event has been great, but the interesting feedback is what the audience would like to see at a future event. This included: Management of Delirium, How to diagnose different types of dementia, Assessment of falls, The elderly and HDU/ITU decisions, Incontinence and “Nothing extra”. Thanks to Dr Wilson and family who provided a lovely buffet after the event which allowed medical students and trainees to talk informally and inspire a further generation of geriatricians. Would we organise another event in Inverness again . . . Absolutely!